Secretary of HCMC Party Committee Nguyen Thien Nhan on September 13 hosted a reception for President of the Japan International Cooperation Agency (JICA), Shinichi Kitaoka. 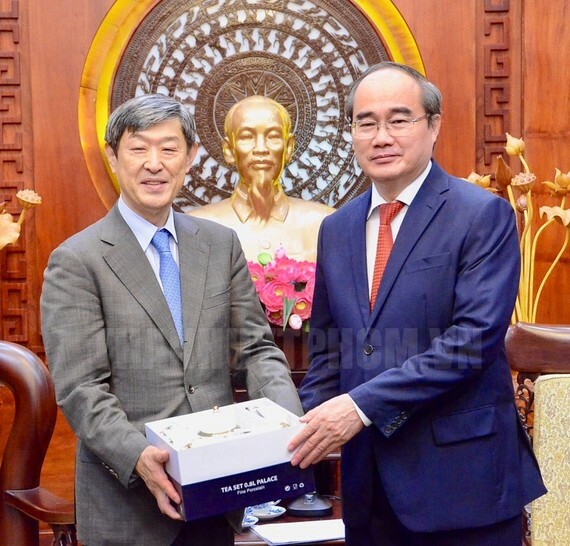 Ho Chi Minh City Party chief Nguyen Thien Nhan highly appreciated the strategic partnership between Vietnam and Japan that is grow more strongly and JICA’s outstanding contribution to the development of Vietnam, including Ho Chi Minh City. He said that JICA has many projects in the city, including the metro route No 1 (Ben Thanh-Suoi Tien). The city is seeing the effects of climate change and the increase in extreme rainfall intensity caused severe flooding. Therefore, it is urgent to accelerate the construction of the drainage system. Mr. Nguyen Thien Nhan hoped JICA will support the city to build giant metal reservoir and upgrade degrade water drainage system in the heart of city, aiming to reduce pollution, depression, traffic jams and flooding. For his part, Mr. Shinichi Kitaoka said that JICA will support HCM City in responding to climate change and reducing flooding. He also proposed the city’s authorities to solve problems to boost the construction of Metro line 1.